Erasmus Darwin. The Temple of Nature. 1802. Charles Darwin's grandfather, Erasmus Darwin, was one of the leading intellectuals of eighteenth century England, a man with a remarkable array of interests and pursuits. Erasmus Darwin was a respected physician, a well known poet, philosopher, botanist, and naturalist. As a naturalist, he formulated one of the first formal theories on evolution in Zoonomia, or, The Laws of Organic Life (1794-1796). He also presented his evolutionary ideas in verse, in particular in the posthumously published poem The Temple of Nature. Although he did not come up with natural selection, he did discuss ideas that his grandson elaborated on sixty years later, such as how life evolved from a single common ancestor, forming "one living filament". He wrestled with the question of how one species could evolve into another. Although some of his ideas on how evolution might occur are quite close to those of Lamarck, Erasmus Darwin also talked about how competition and sexual selection could cause changes in species: "The final course of this contest among males seems to be, that the strongest and most active animal should propogate the species which should thus be improved". Erasmus Darwin arrived at his conclusions through an "integrative" approach: he used his observations of domesticated animals, the behaviour of wildlife, and he integrated his vast knowledge of many different fields, such as paleontology, biogeography, systematics, embryology, and comparative anatomy. This "integrative" approach is the very foundation upon which the U.C. Museum of Paleontology and the recently formed Integrative Biology Department at the University of California at Berkeley are built. 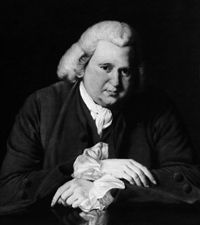 In addition to Erasmus Darwin's contributions to the future of biological studies, he was also a leader in an intellectual community that contributed to the emergence of the industrial era. Among his intellectual peers were James Watt, Matthew Boulton, Joseph Priestly, and Josiah Wedgwood. It is probably no coincidence that Charles Darwin, the grandson of such a progressive thinker, produced some of the most important work in the history of biological and social thought. More information about Erasmus Darwin's evolutionary thought and its impact can be found at the Victorian Web, an important resurce for the history and culture of the Victorian period.